With their Vitra Lounge Chair & Ottoman Charles & Ray Eames have put the classic club chair in a contemporary and glamorous attire. An object which soon after its release was awarded a coveted Triennial Prize in Milan. The combination of high-quality leather upholstery and plywood shells, set upon a revolving foot guarantee a uniquely comfortable sitting experience. 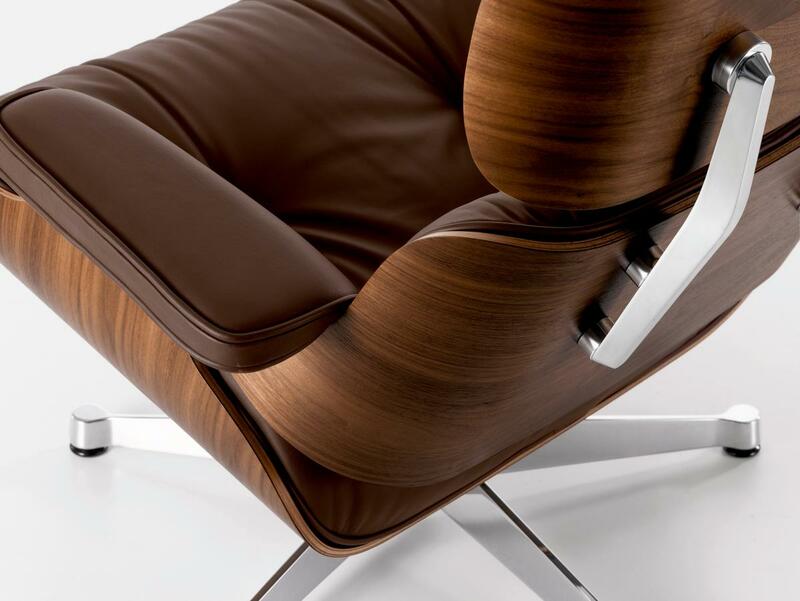 Be it in the classic versions or in new colour combinations, in an Eames Lounge Chair one always shows deportment while relaxing. Optionally available with glides for carpets or felt pads for hard floor surfaces. All leather surfaces are to be cleaned according to the directions in the accompanying leaflet. 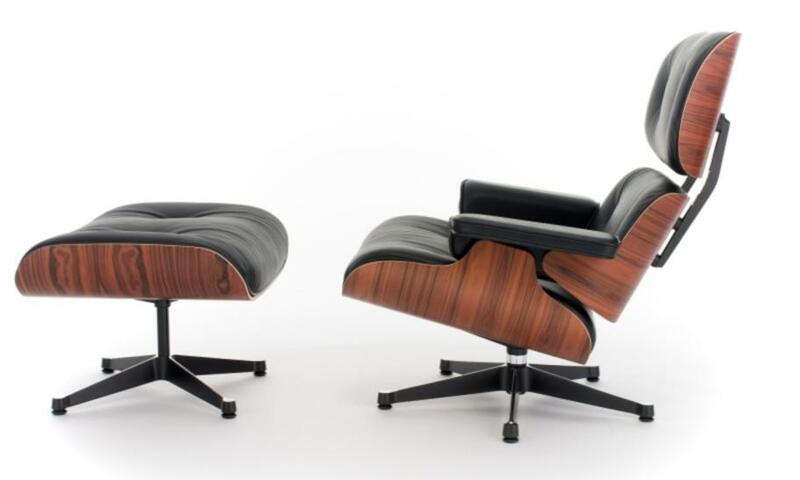 Can the Eames Lounge Chair and Ottoman be bought separately? 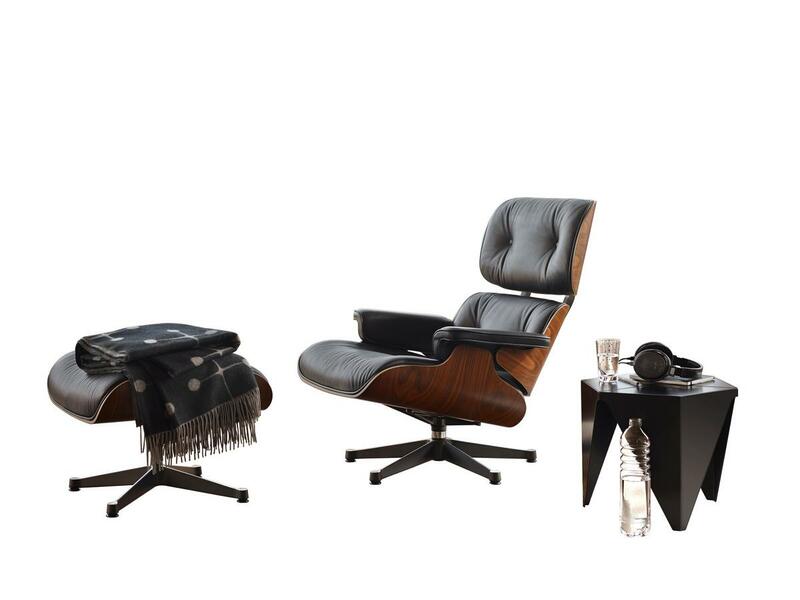 Yes, the Eames Lounge Chair and Ottoman (classic version) can be purchased separately. Please beware however that when purchased independently of one another slight differences in the wood grain and colour are, on account of the fact wood is a natural material, inevitable. 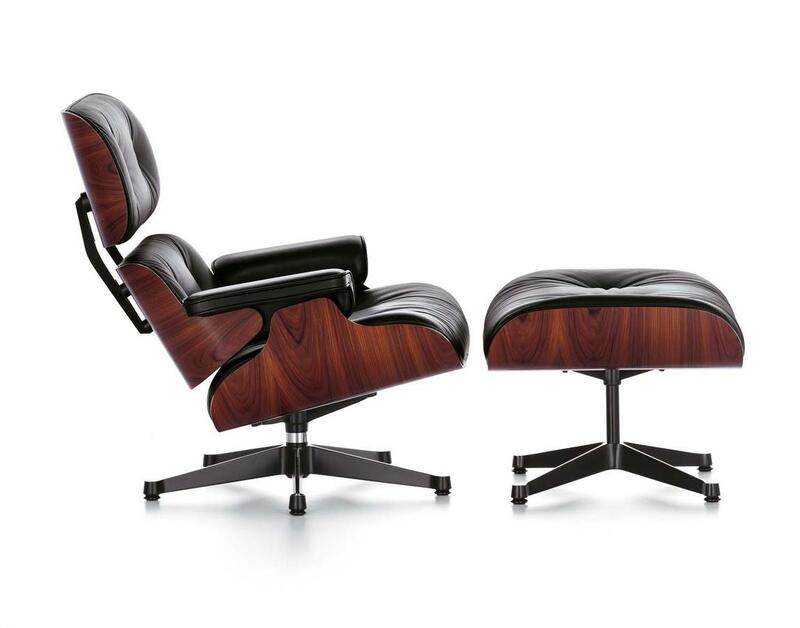 Why are the Eames Lounge Chair and Ottoman offered in two sizes? The classic dimensions are those of the original 1956 design. 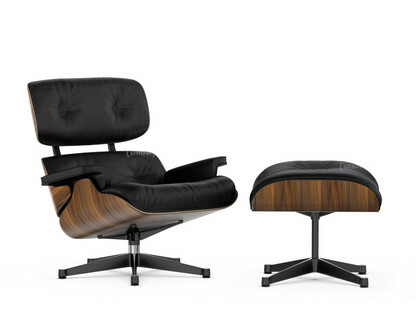 That the average human today is larger than the average human was then, Vitra, in close co-operation with the Eames Office, increased the dimensions of the Eames Lounge Chair and Ottoman. The proportions and the unique aesthetic of the object remains the same. Just bigger. 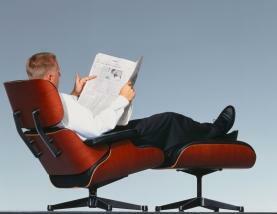 Is there a difference between the Vitra Eames Lounge Chair and that from Herman Miller? Vitra hold the license and distribution rights for the works of Charles and Ray Eames in Europe and Asia. Herman Miller for all other regions. 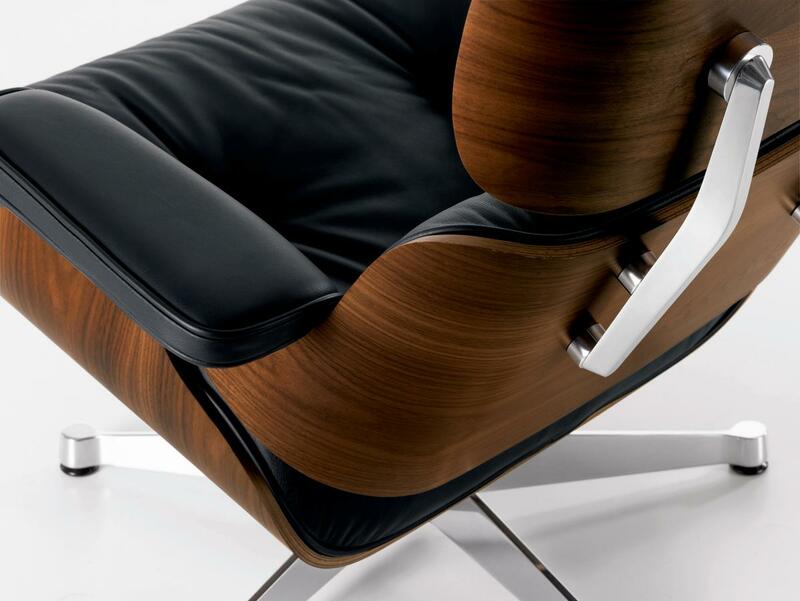 Although essentially identical, the base of the Vitra Eames Lounge Chair has slightly thinner arms than the version from Herman Miller. 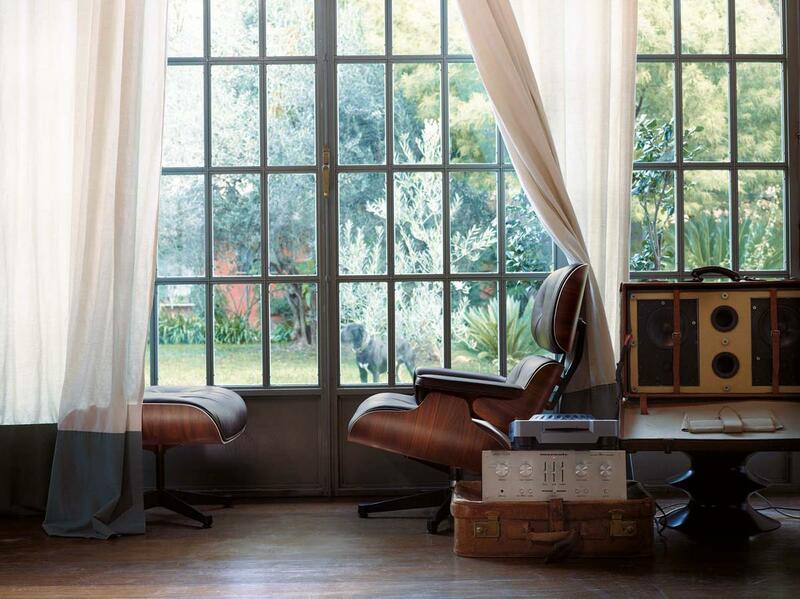 With their Lounge Chair Charles and Ray Eames' intention was to create a contemporary version of the classic club chair. As with the club chair comfort was a top priority. Comfort combined with a hint of luxury. 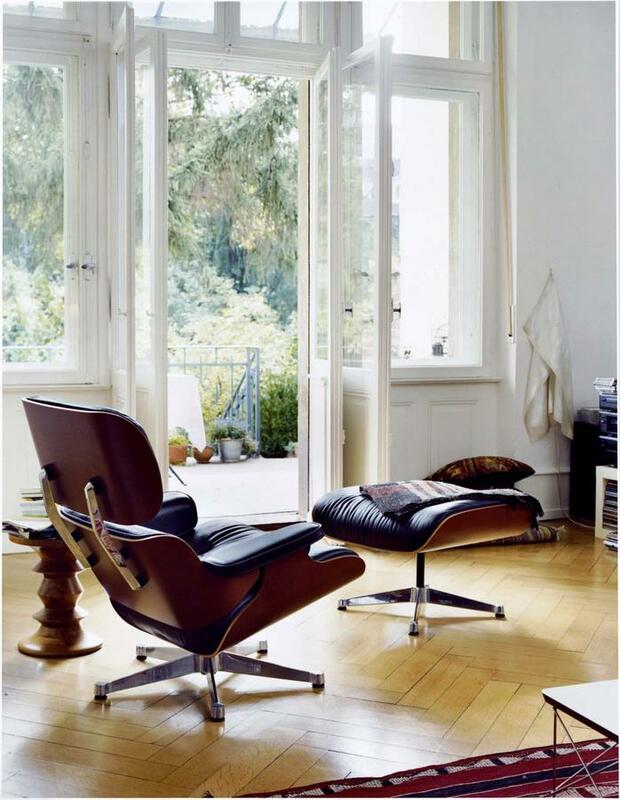 Launched in 1956 the Eames Lounge Chair achieves just this is an object that is lighter, more refined, more elegant than its ancestor. 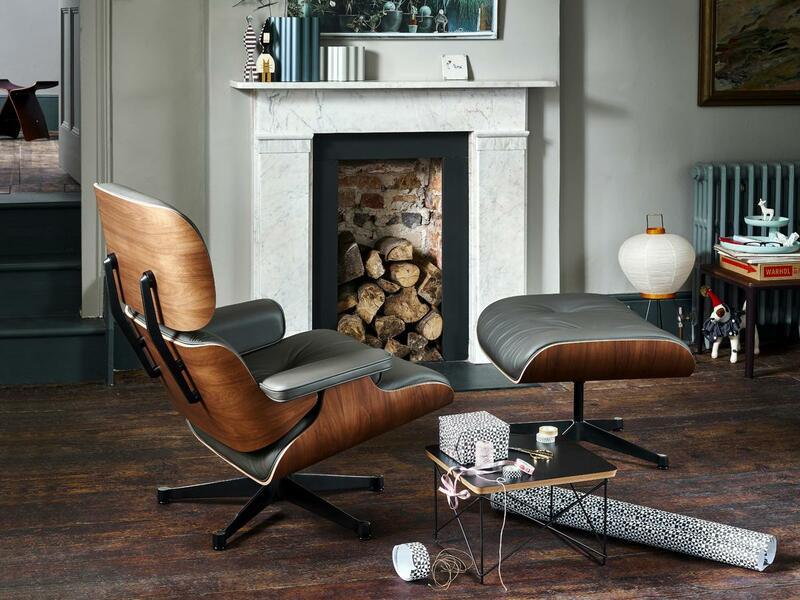 With its dulcet combination of moulded plywood and leather upholstery the Eames Lounge Chair is not only a delightful re-interpretation of a traditional furniture standard but an enchanting combination of materials and emotion. 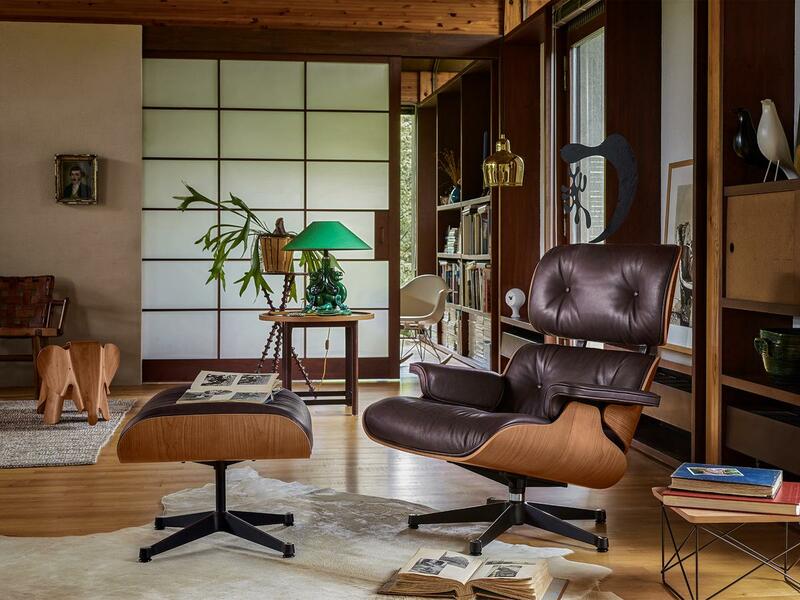 The Eames Lounge Chair is complemented by an equally refined Eames Ottoman. 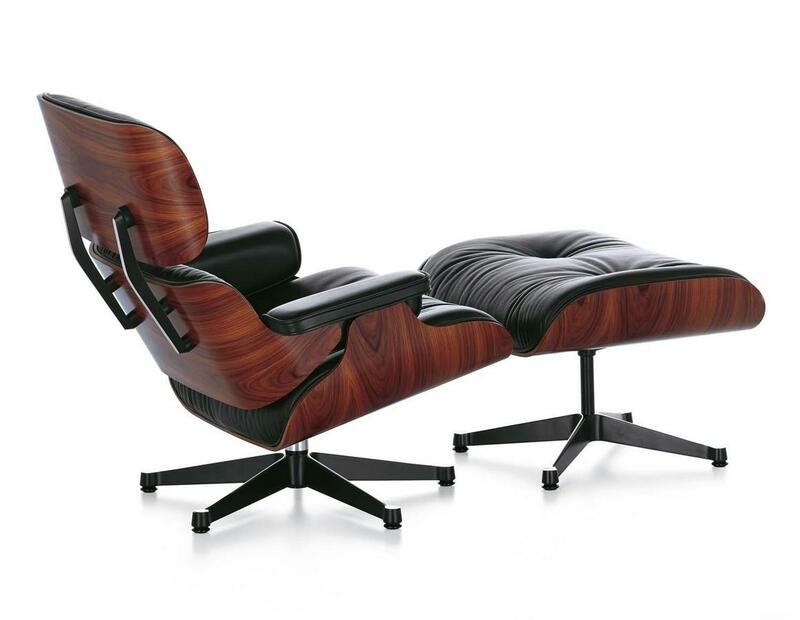 In addition to being included in the Permanent Collections of numerous museums, including the MoMA New York, V&A London or Grassi Museum Leipzig, the Eames Lounge Chair has received numerous prizes including the Triennale Milan Award. Legend has it that the original inspiration for the Lounge Chair cam from a request from the American film director Billy Wilder. 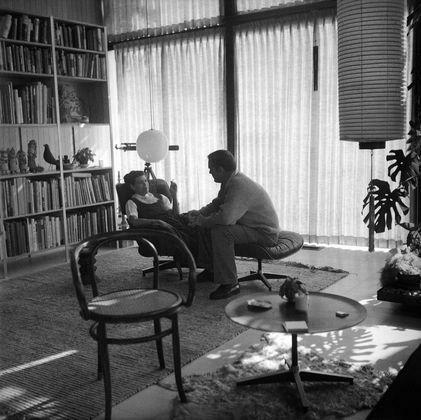 A long time friend of Charles and Ray Eames, Billy Wilder would often complain that he was unable to find an armchair which was both contemporary and comfortable. To meet his wishes the Lounge Chair was created. Allegedly. Wilder did however take a deep interest in the development of the project and received one of the earliest prototypes. And so it was only logical that for the Vitra's 1980s "Personalities" advertising campaign Billy Wilder was photographed in and Eames Lounge Chair. 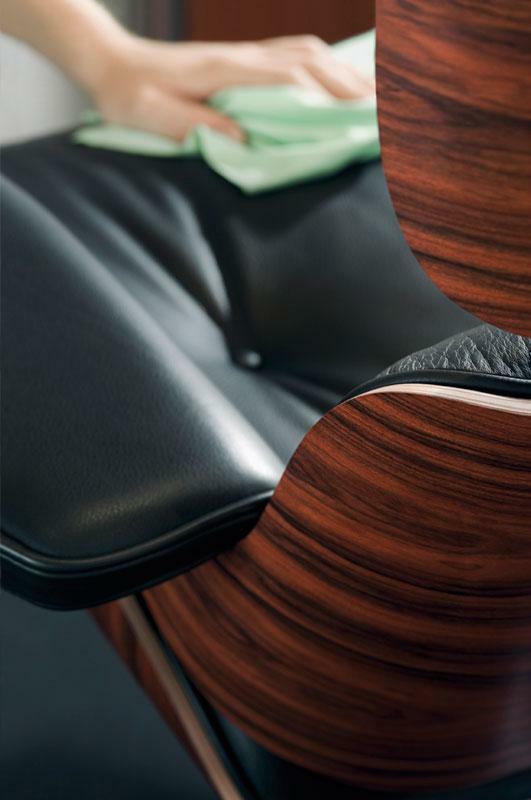 The seat and backrest of the Eames Lounge Chair are formed from a combination of moulded plywood shell and leather upholstery. 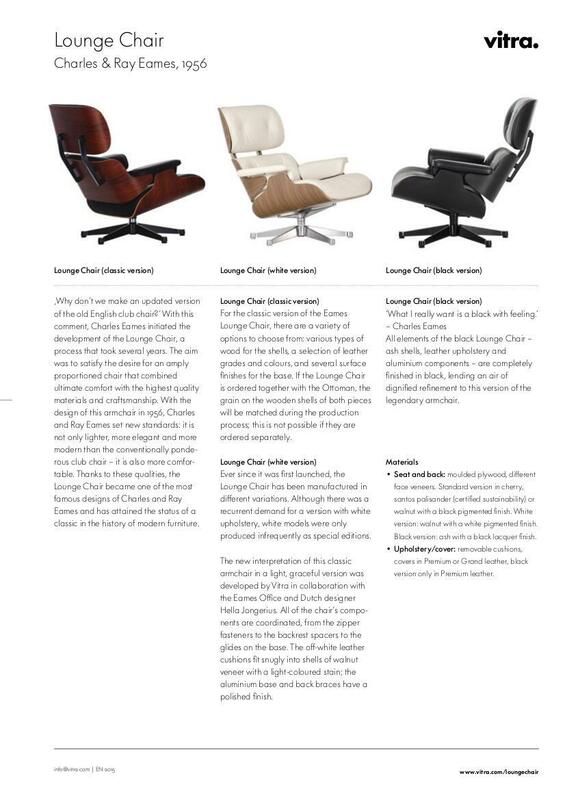 Each Lounge Chair comprises three such shells: one for the seat, one for the backrest and a third as head rest. 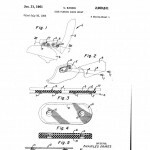 The seat construction is completed by a pair of cushioned leather armrests. A swivel, aluminium base supports the seat construction. 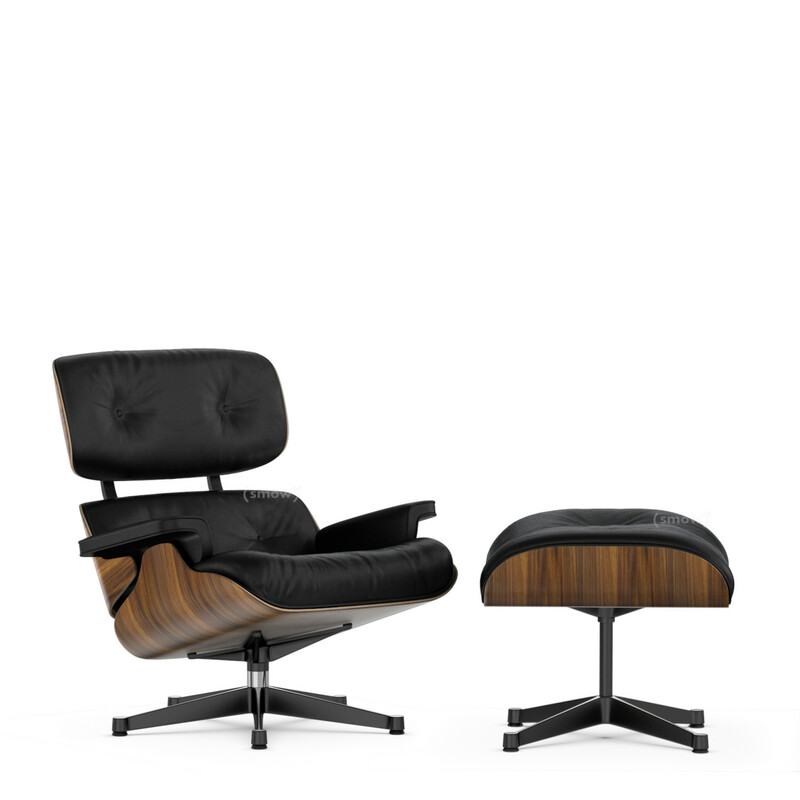 The complimenting Eames Ottoman is of an identical construction principle as the chair, just with a non-swivel base. Both Lounge chair and Ottoman are available in a range of wood types, leather colours and base finishes. 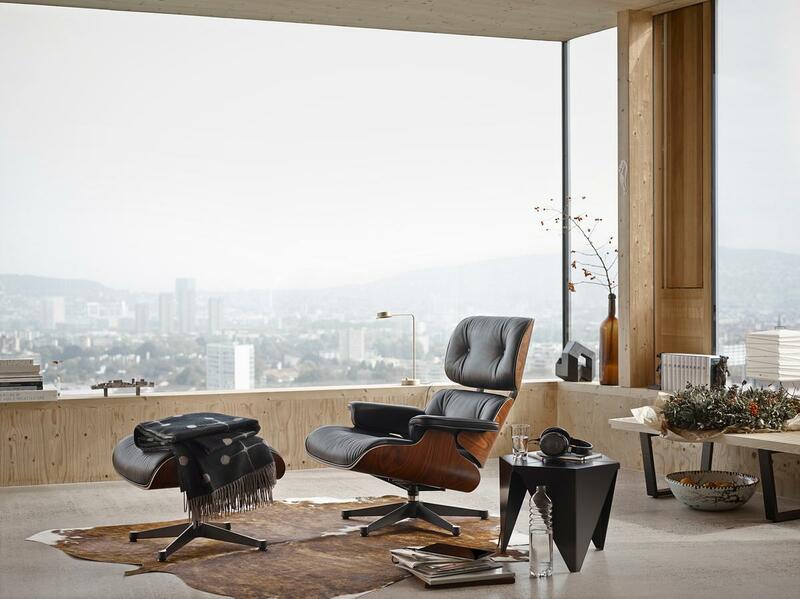 As with all Eames furniture designs the Eames Lounge Chair and Ottoman are exclusively produced for Europe and Asia by Vitra. And for almost 50 years that production process has involved the same 47 steps. What has changed over the decades is the size of the average human: in some regions we are now on average 10cms taller than in the 1950s. 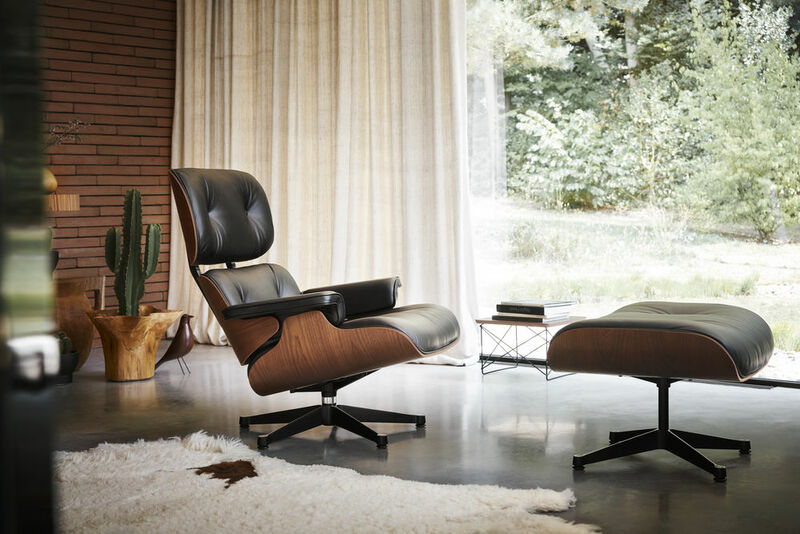 Reflecting this development Vitra now offer the Eames Lounge Chair in two sizes: The classic 84 cms high version and a new 89 cm version. 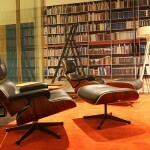 With the Lounge Chair Atelier on the Vitra Campus Eames Lounge Chair & Ottoman manufacturer Vitra provides its customers with a unique insight into the making of this most classic of all furniture designs. Visitors are invited to observe and experience how the original Lounge Chair and Ottoman are carefully constructed an assembled. Then such a design classic tend to gain value over time. Not least on account of the individual, and comforting, patina that develops with time on the leather upholstery. 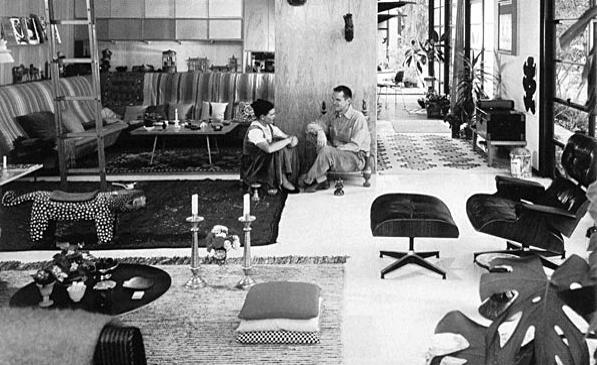 Charles and Ray Eames belong, with question, to the ranks of the most important designers of the 20th century. In 1940 in St. Louis born architect student Charles Eames met Californian abstract artist Ray Kaiser at the Cranbrook Academy of Art, a year later they married and moved to Los Angeles where they established the so-called Eames office. In context of their design partnership Ray Eames' artistic tendencies perfectly complimneting which Charles Eames architectural understanding. From this extremely fruitful combination of talents emerged numerous furniture designs such as the Eames Lounge Chair, which were first sold in the United States by Herman Miller and later in Europe on Vitra. But not only groundbreaking furniture design emerged, also buildings, exhibitions, films, toys, graphic works and textile designs. Over the years of their cooperation Charles and Ray Eames developed a form language that is as elegant as it is playful, a form language influenced by modern art and architecture which was to itself influence the development of the 20th century American modernism. Charles and Ray Eames revolutionised domestic spaces in that the freed it from the controlled, conservative standards of the pre-war years. A freedom beautifully demonstrated by the so called Eames House the pair built at Pacific Palisades, Los Angeles. The Eames House presents a clear, uncluttered, modern form and is largely furnished with Eames furniture. 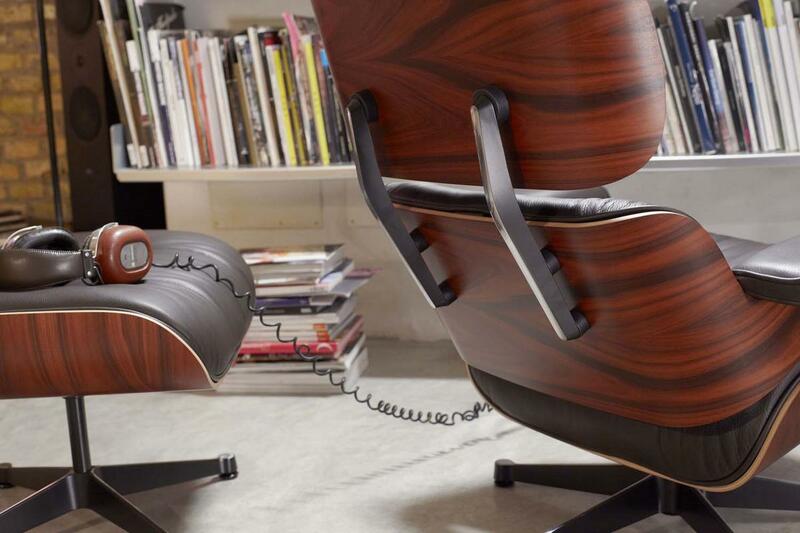 Including, naturally, the Eames Lounge Chair. 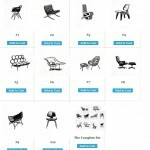 The Eames furniture is complicated in the Eames House by accessories which demonstrate the pairs influence by and attraction to the avant-garde and folk art. In the execution of all their projects the Eames were continually seeking to develop new processes and/or find new uses for materials: something they achieved with a regularity, creativity and innovative flair far beyond their peers. Particularly noteworthy examples being their plywood, wire, aluminium and plastic chair collections. Charles Eames died on August 21st 1978, Ray Eames on August 21st 1988. 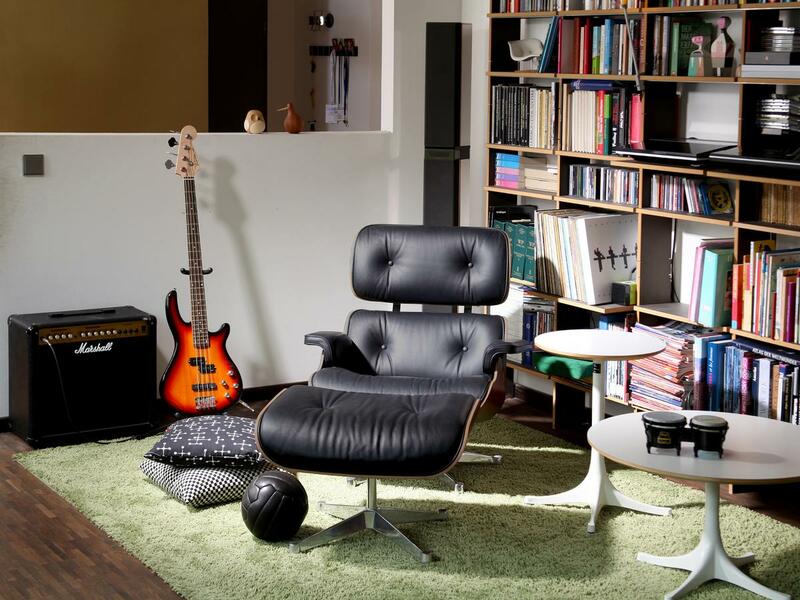 Released in 1956 as a modern interpretation of the classic club chair the Eames Lounge Chair beautifully personifies the the spirit of the 1950s Post World War II the global community was looking for a new orientation - one which provided the necessary distance to what had gone before. In Germany this search developed into the so-called Guten Form, in Scandinavia the organic modernism as characterised by designers such as Arne Jacobsen or Eero Saarinen. In addition the 1950s saw the beginnings of that which has developed into our contemporary consumer culture, a development that saw the home developed ever more to a sanctuary from the stress of the working day. 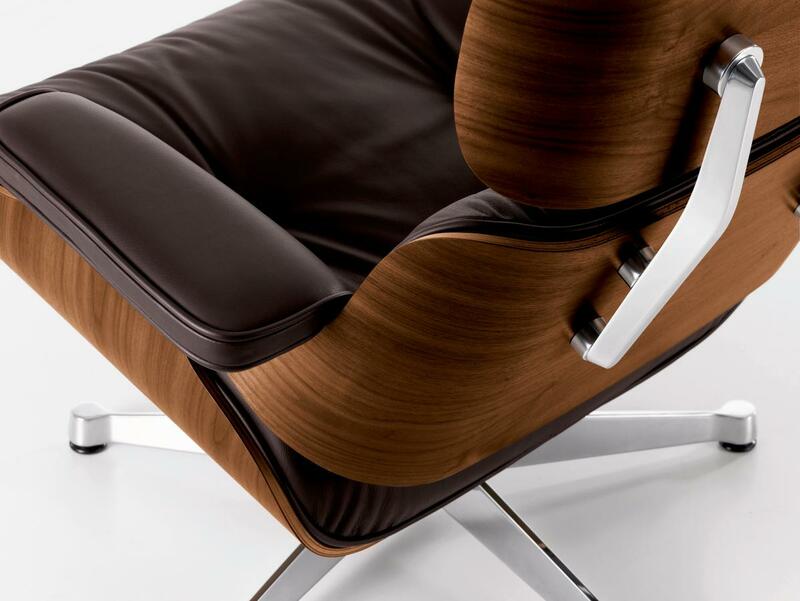 An object such as Charles and Ray Eames Lounge Chair reflecting the spirit of these changes. Closely linked with the name Eames is that of the Swiss designer furniture manufacturer Vitra; Vitra founder Willi Fehlbaum being, so to speak, the discoverer of the Eames furniture for Europe. During a taxi ride through New York Fehlbaum spotted an Eames Chair already being manufactured in the USA Herman Miller. Willi Fehlbaum and his wife Erika were so excited about the Eames designs that they promptly acquired the license for the production of the pieces in Europe. 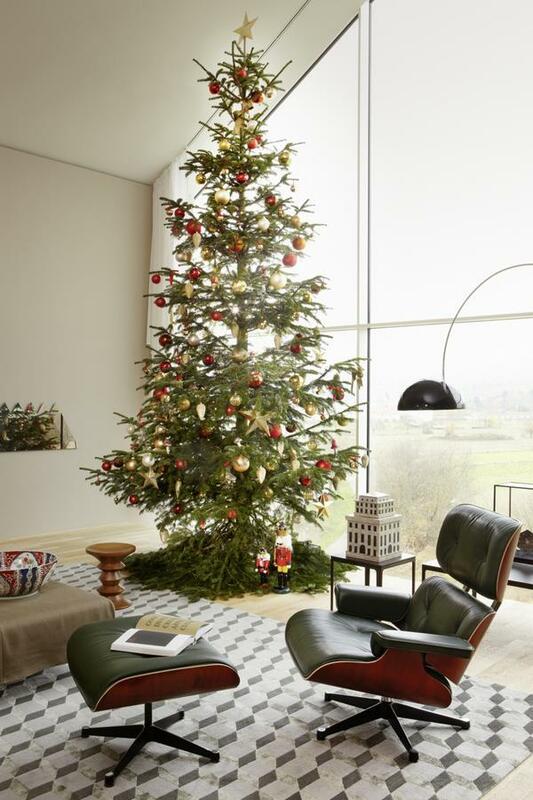 Since the 1950s, Vitra has been the only authorized dealer for Eames furniture, including the Lounge Chair & Ottoman, in Europe and Asia. 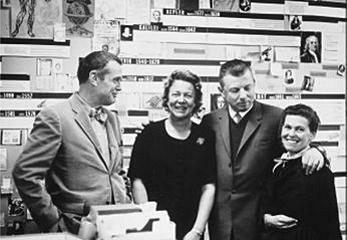 Over the years a very very close relationship developed between the Fehlbaums and the Eames, so much so that following Ray Eames death in 1988 the estate of Charles and Ray Eames was entrusted to Vitra. 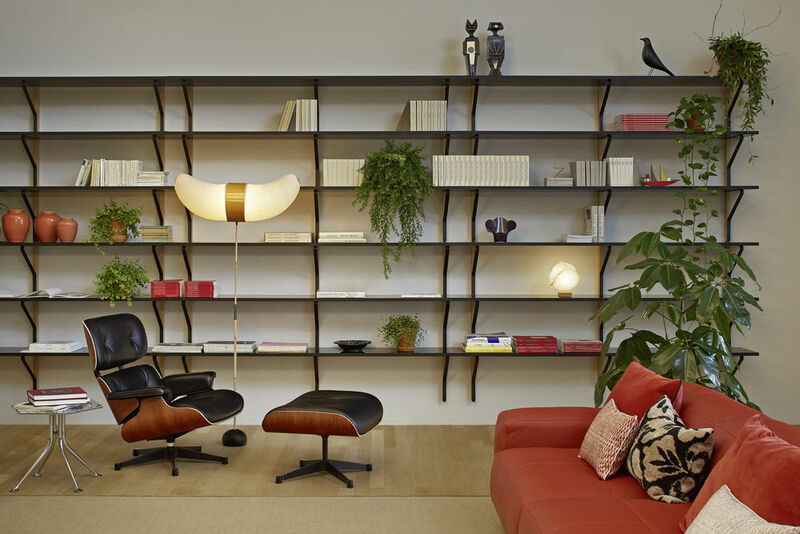 However not only their cooperation with the Eames' has been responsible for establishing Vitra's position and dominance. In addition to the Eames Lounge Chair & Ottoman, Vitra produce design classics by greats such as Verner Panton, Alexander Girard and George Nelson as well as modern designs by. 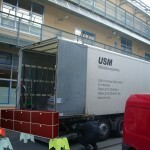 for example, Ronan & Erwan Bouroullec, Jasper Morrison and Maarten van Severen. In addition, with the Vitra Campus and its architecturally significant buildings and the Vitra Design Museum with its design significant collection, Vitra make a notable contribution to the documentation of architecture, art and design history.